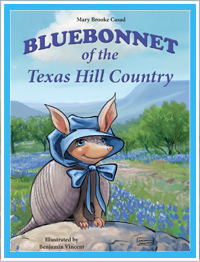 Bluebonnet the armadillo was born in the Texas Hill Country, the daughter of Mommadillo and Daddidillo. Since armadillos are always born in fours, either all boys or all girls, Bluebonnet has three sisters: Normadillo, Irmadillo and Arvilladillo. Her first adventure out of the burrow, at age six months, took her to camp, where she learned that when she focused on others’ safety and well-being, rather than her own insecurities, she overcame the fear which constantly caused her to run away. Bluebonnet is invited to become a camper when she saves the lives of two campers from a flash flood on the Guadalupe River. In Dallas, Bluebonnet sets out to see her Aunt Armadilly, who lives in a burrow at the Cotton Bowl in Fair Park, home of the State Fair of Texas. She scrambles across the football field during the Texas-OU game, where she’s mistaken for the football, and meets a new friend, Joe Bob Bunny. Together, they seek out the clues Aunt Armadilly has provided to give them a tour of the State Fair. Big Tex lends a helping hand to the two fair-goers when it appears they’ve lost their way, which enables them to end up at the place where Joe Bob Bunny started—-the Livestock Pavillion. Traveling on to Austin, Bluebonnet encounters a dive-bombing mockingbird named Mac. The two quickly become friends and Mac offers to give Bluebonnet a tour of the Texas State Capital. Amidst the stately halls they meet up with a group of schoolchildren who are lobbying for a state mammal. Some support the longhorn, others the armadillo. Bluebonnet and Mac soon meet Bevo the Longhorn, the mascot of the University of Texas. The tension between the two rivals builds until Mac learns the results of the Texas legislature’s vote: the longhorn is the large state mammal, and the armadillo is the small state mammal. They celebrate with the official dance of Texas: the square dance. Bluebonnet next travels to Marshall to see the newly-renovated train depot. Her tour guide is T.P., a cat whose job it is to rid the depot of mice. He’s named for the Texas and Pacific Railroad. Bluebonnet learns much about Marshall’s past when Texas and Pacific Railroad employed people from around the world to work in the train yards. But when she tells T.P. she’s never ridden a train, he confesses that he hasn’t either. Bluebonnet sees a chance for them to take their first train ride…..and they hop aboard just in time! Just down the road from Marshall in the town of Kilgore, Bluebonnet visits her sister Irmadillo. Irmadillo and her husband “Dad” Joiner Dillo have four sons: Bradford, Lloyd, Hunt and Wildcatter. The four nephews tell Aunt Bluebonnet all about their oil-industry namesakes and take her on a tour of the East Texas Oil Museum, which features a trip back in time to Boomtown. Bluebonnet explores the Ocean Star Museum in Galveston. She learns about life on the drilling rig, off-shore history, and rig safety through the tour guide and knowledgeable pelican, Red. Bluebonnet learns that the museum itself was once a working off-shore rig, where people lived and drilled for oil beneath the sea. 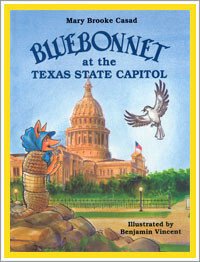 Bluebonnet is a traveling Texas armadillo, always eager to see new sights and make new friends!